One of the most detailed queues in all of Walt Disney World is at Expedition Everest. It is set up as the fictional village of Serka Zong. Although the village is made up, most of the artifacts that can be seen in the queue are actually from the Himalayas. 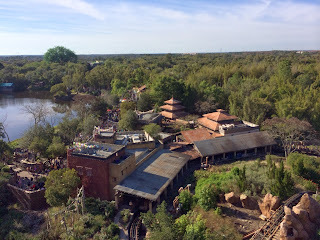 I took this aerial shot of Serka Zong while climbing the lift hill on Everest today. Earlier this month, the Incredibles "Super Dance Party" took over the Rockettower Plaza Stage in Tomorrowland at the Magic Kingdom. You can see Mr. Incredible, Frozone, and Elastigirl dancing with guests here on a daily basis. The kids seem to love the close interaction with these famous Pixar characters. 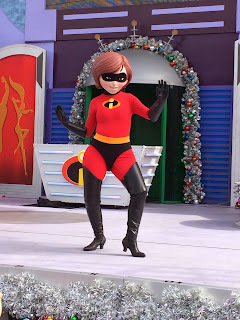 I took this shot of Elastigirl today. As I've mentioned many times over the past few weeks, Disney does a great job of decorating the parks for Christmas. 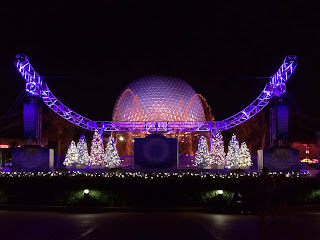 Whenever there are special events or holidays, Epcot usually puts up special topiaries inside the entrance to the park. 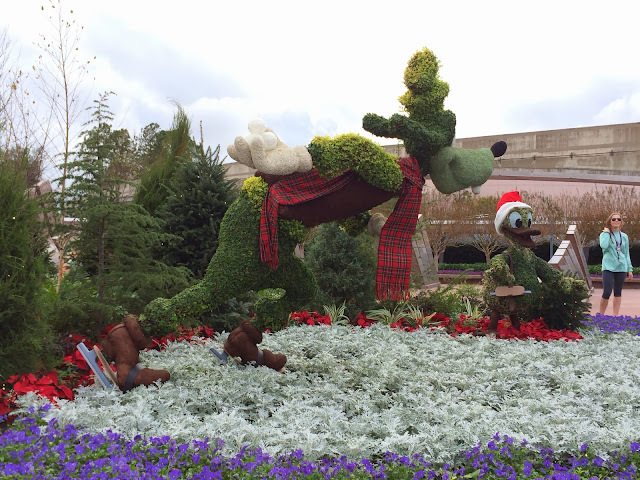 Christmas time is no exception, as you can see Goofy and Donald on an ice skating rink made of white flowers. I took this shot while giving a tour of Epcot today. While giving a tour at Hollywood Studios today, I had lunch at the Studio Catering Company. Shortly after ordering, I experienced some Disney magic that I hadn't seen before. As the cast member was approaching the counter with my tray of food, she informed me that since mine was a different color, I had the "magic tray." She then went on to yell something to the other cast members behind the counter, and they all chanted something related to my unique tray. The cast member then informed me that I won a free dessert, and I chose this delicious "holiday" gingerbread cupcake. Once again, I saw Disney karma in action. Just a short while before lunch I gave away some extra FastPasses to some guests who were getting into a two hour Rock 'n' Roller Coaster line. 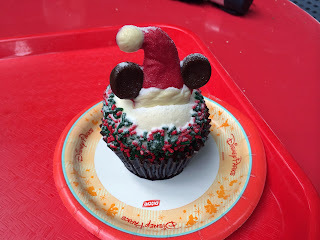 It looks like I may have traded those FastPasses for that yummy cupcake.....if you believe in karma! 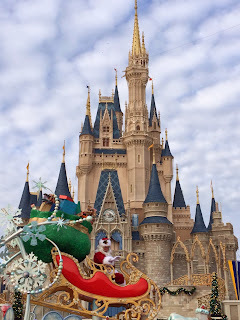 One of the perks of visiting the Magic Kingdom during Christmas week is the ability to enjoy Mickey's Once Upon a Christmastime Parade. Throughout most of November and December, it is reserved for guests attending Mickey's Very Merry Christmas Party. I got my tour guests situated in a good spot to enjoy the parade from the hub today. 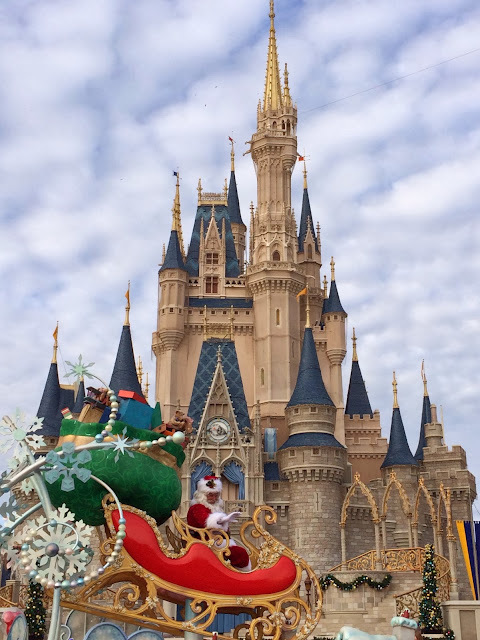 I was able to take a few steps back from the street and snap this shot of Santa crossing in front of Cinderella Castle. 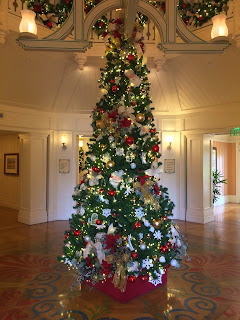 This Christmas tree is in the lobby of the Beach Club Villas. Every Disney resort has trees up this time of year. 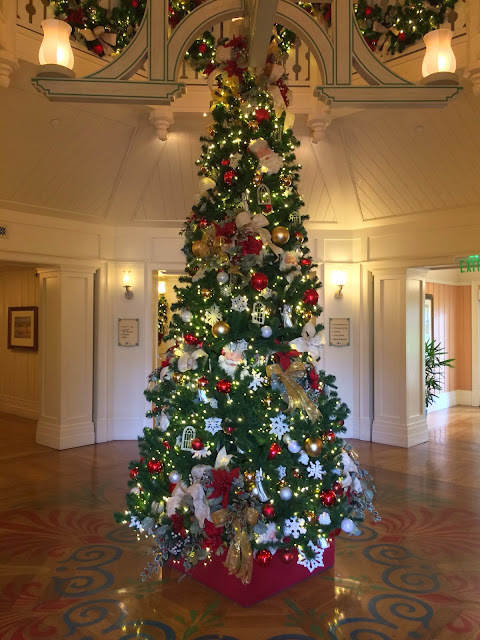 In fact, there are more than 1,500 Christmas trees located around Walt Disney World property. I took this shot a few weeks ago. 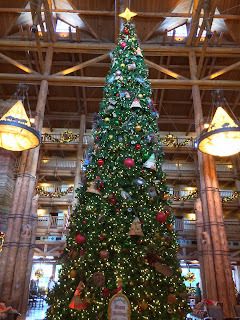 Wilderness Lodge is one of my favorite resorts in Walt Disney World, and this is especially true during the Christmas season. With the giant fireplace and the rustic theming, this hotel already gives guests the feel that they are in a place with a much colder climate than Florida. Add some great decorations and a gigantic Christmas tree, and the Wilderness Lodge is the perfect spot during this time of year! Today we say happy 15th birthday to La Nouba. 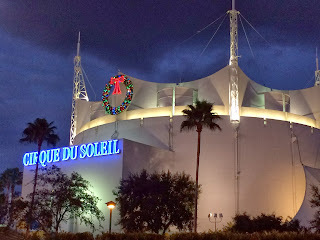 This Cirque du Soleil show debuted at Downtown Disney on December 23rd, 1998. With a cast of 65 international performers, La Nouba is one of the most unique and amazing shows in all of Walt Disney World. I took this shot of the theater a few weeks ago, and you can see it is decorated with a giant wreath for the Christmas season. Tigger is a popular character in our house as he is my wife's favorite and also the name of one of our cats. This shot from a few weeks back shows the famous tiger on his way to his "greeting" area, which is located next to The Many Adventures of Winnie the Pooh in the Magic Kingdom. 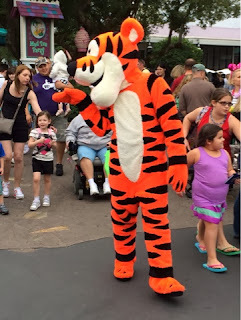 Tigger had just blown a kiss to my wife prior to me snapping this photo. Today we say happy 76th birthday to Snow White and the Seven Dwarfs. This full length animated feature debuted at the Carthay Circle Theater on December 21st, 1937. 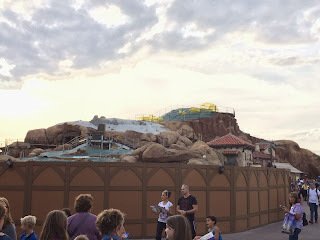 To commemorate this day, I thought it appropriate to post a construction update on the Seven Dwarfs Mine Train attraction. It looks like it is in the final stages, and we hope to see it open in the next few months. Today marks the 42nd anniversary of the passing of Walt's brother, Roy O. Disney. Roy was the unsung hero of the Disney company, and he was responsible for seeing Walt's dream of the "Florida Project" come to fruition. He died less than three months after the Magic Kingdom opened. 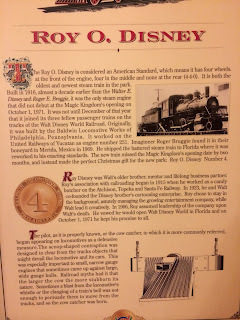 The Disney company honored Roy in naming one of the park's steam locomotives after him. This "write-up" about the train is located on the wall of the lower level of the Main Street railroad station. The Caribbean Beach Resort was the first Walt Disney World hotel to fall in the "moderate" category. However, when it first opened in 1988, it was considered "deluxe." The main pool at the Caribbean has a fun pirate theme with two water slides and an adjacent splash pad area for young kids. 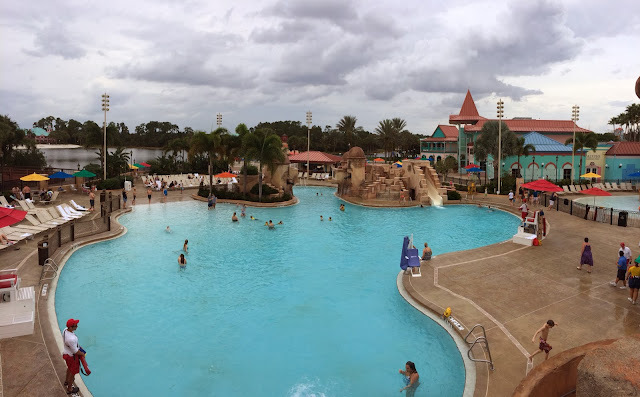 I actually snapped this panorama from the top of the larger waterslide. The Candlelight Processional is a Walt Disney World tradition that currently takes place at Epcot. However, it first took place at the Magic Kingdom exactly 42 years ago tonight. On December 18th, 1971, 1200 carolers from across Florida processed down Main Street to the Cinderella Castle forecourt. Currently, the event takes place 3 times per night throughout the Christmas season at the America Gardens Theater. The celebrity narrator of this musical story of Christmas changes every two or three days. Last week we saw Dennis Haysbert narrate the show. I took this shot from just outside the back of the theater. 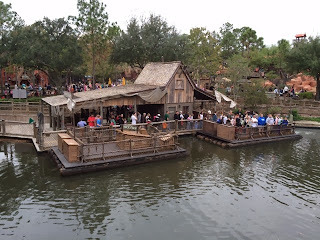 Some of the best pictures of Frontierland at the Magic Kingdom can be taken from the Liberty Square Riverboat. I took this shot a few days ago from the second deck of the vessel. You can see the Huck Finn and Becky Thatcher rafts parked in front of the Frontierland dock. Although the Liberty Belle isn't an "exciting" attraction, I certainly recommend it to photography buffs! 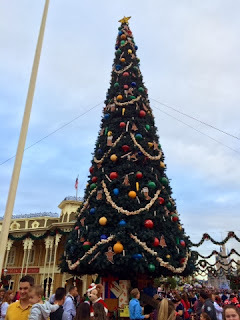 One of the biggest icons of the Christmas season is the Magic Kingdom Christmas tree. The interesting thing is that it is one of the last decorations to go up. 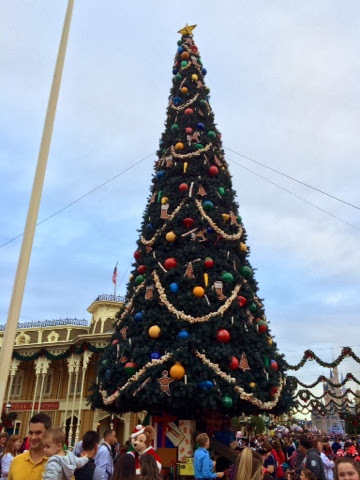 It didn't appear in Town Square until the second week of December. This is because they tape the "Christmas Day" parade during the first week, and the tree would block the view down Main Street. 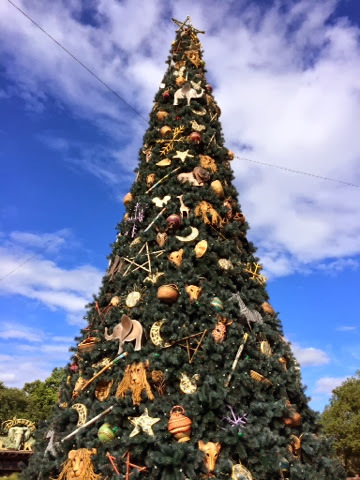 There are actually 1,500 Christmas trees around the Walt Disney World resort, and the huge Magic Kingdom tree is quite possibly the final one to be erected each year. Today we say happy 40th birthday to Pirates of the Caribbean. This classic attraction debuted on December 15th, 1973, more than two years after the Magic Kingdom opened. Although it was a hit in Disneyland, they didn't think it would be as popular in Florida. However, guests visiting Walt Disney World were upset that Pirates was missing and Disney realized they had made a mistake. They quickly started building the attraction and it opened on the 7th anniversary of Walt Disney's death. I don't usually post family shots, but I thought that it would be fun to include this one from today. We are wearing "Happy Birthday Pirates" buttons. For those who weren't sure.......yes, I am a Disney nerd! 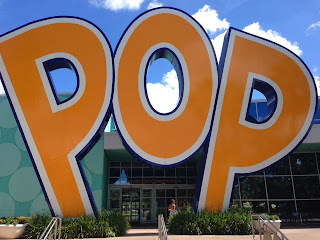 Today we say happy 10th birthday to Disney's Pop Century resort. After many delays, this location opened on December 14th, 2003. It is my favorite value resort on Disney property. In addition to the decent amenities and fun theming, it is connected to the Art of Animation resort via a bridge. A short walk gives Pop Century guests access to another fun location. I took this shot a few months ago when my family spent the night there. This area faces the large pool from the back of the lobby. I always love walking around Epcot at night, but the decorations at Christmas time make it even more fun. This stage in front of the "Fountain of Nations" is for Joyful! A Gospel Celebration of the Season. This energetic show takes place four times a day, with Spaceship Earth as its backdrop. It is just one of the many additional live entertainment offerings that can be found at Epcot during the holiday season. 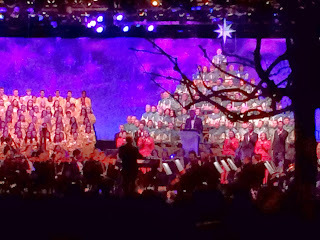 I took this shot tonight after enjoying the Candlelight Processional with my family. As we were walking around Coronado Springs today, my wife and I came upon these three topiaries. 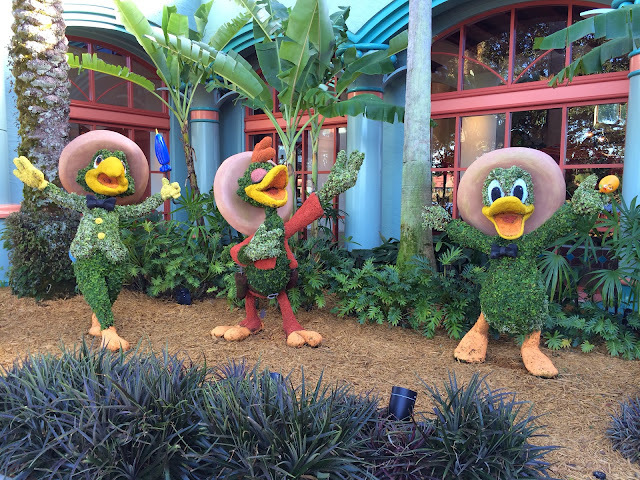 Most Walt Disney World fans will recognize them as the Three Caballeros from the Gran Fiesta Tour in the Mexico pavilion at Epcot. Originally, Donald, Panchito, and Jose Carioca starred in the 1944 movie, The Three Caballeros. However, we think of them as part of the Epcot attraction, as most of us weren't around when the movie came out. One of my favorite things about Kilimanjaro Safaris at Animal Kingdom is that it is never the same experience twice. This was true today, as I spotted this hippo walking on land. Most of the time you see these guys in the water. We were on the very last safari vehicle of the day, which was at about 5:00. 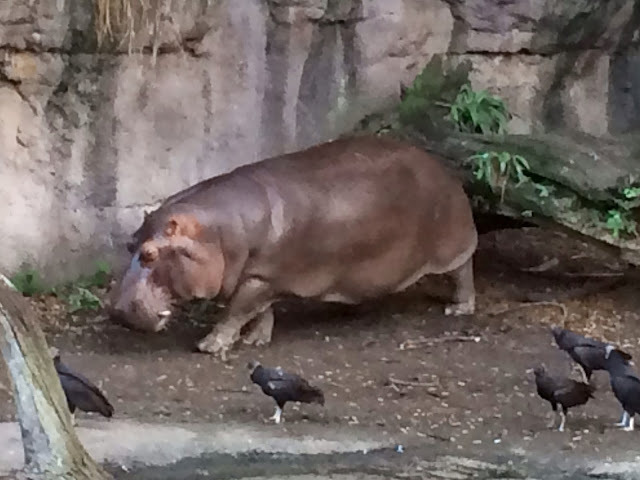 Although it was fun seeing the hippo, most of the other animals were already in their holding areas for the night. I wouldn't recommend waiting till the end of the day to "go on safari." Today is the 10th anniversary of an interesting addition to an attraction at Epcot. 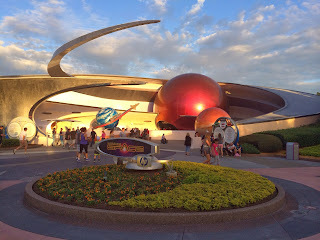 Although Mission Space opened in August, it took nearly four months for Disney to add these "accessories" to the ride. On December 10th, 2003, motion sickness bags made their appearance for the first time on a Disney attraction. It makes you wonder how many people had an unpleasant experience during the ride's first months in operation. I took this picture of Mission Space a few weeks ago. The Christmas decorations around Walt Disney World are amazing, and each resort features something unique. I enjoy walking around the Boardwalk area this time of year because you can see the decorations at five different resorts. My family and I took this stroll on Thanksgiving night. We were especially impressed by the Gingerbread Carousel in the lobby of the Beach Club. This is the 14th year of the carousel display and it seems to be very popular. 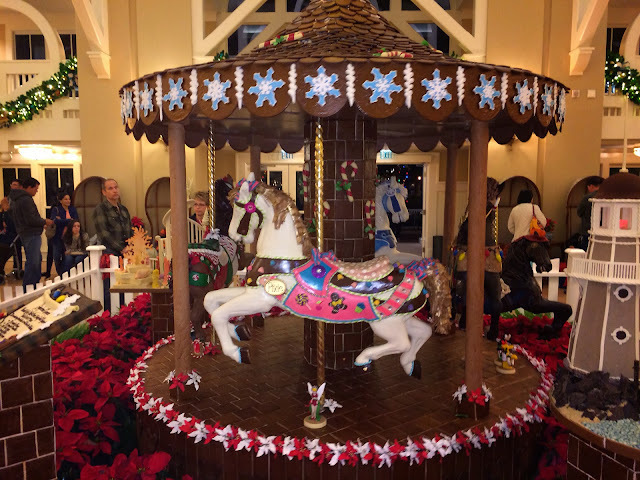 Some of the yummy ingredients in this edible, spinning creation are 2013 pieces of gingerbread, 150 pounds of icing, and 100 pounds of chocolate. As most of you know, Digital Disney World is primarily a place where I post daily pictures from around Walt Disney World. However, when I first started this website, nearly three years ago, I would write articles about ways to stay connected to "The World" using modern technology. I primarily featured websites, blogs, apps, etc. to keep us interested in the "Vacation Kingdom" when we couldn't be there ourselves. I have recently been introduced to a great new website that I thought would be of great value to my readers. So today, I am going back to my old format to feature some "modern technology" in the form of the Walt Disney World Vacation Hub. 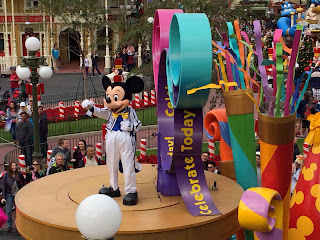 First and foremost, the Walt Disney World Vacation Hub can be found at WDWvacationhub.com. It was started by a Disney fan named Mike, and is not affiliated with the Disney company. The tag line for the site really describes it perfectly: "Linking You to The Best WDW Resources on the Web." 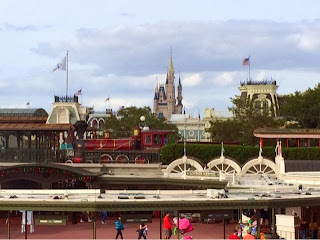 This is truly a place to find current information on anything and everything related to planning a Walt Disney World vacation. It is a well designed site that organizes the different aspects of vacation planning into major sections. Each section contains links to appropriate websites on that topic. Mike has included everything from park tickets, dining, apps, hidden Mickeys, and so much more. In addition to some of the "official" websites, there are a large number of blogs and fan sites included throughout the Vacation Hub. 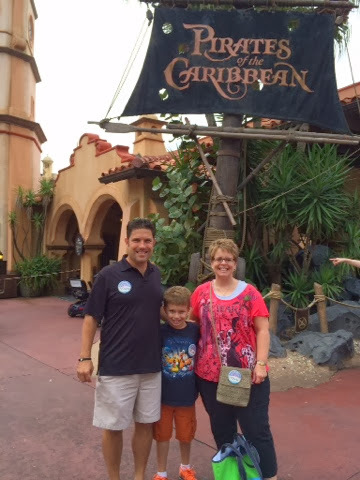 It gives visitors a chance to see the opinions of Disney fans and travel professionals. This type of information is so valuable when you are planning a Walt Disney World vacation. 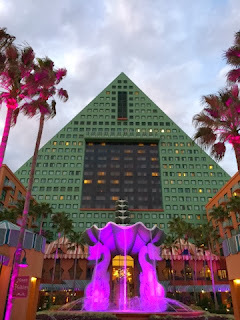 If you are getting ready to book a vacation or just want to learn something new about Walt Disney World, I highly recommend heading over to WDWvacationhub.com! 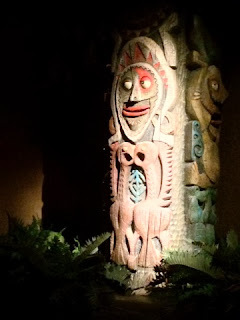 We took our seven year old son to Walt Disney's Enchanted Tiki Room yesterday, for the first time since he was a baby. 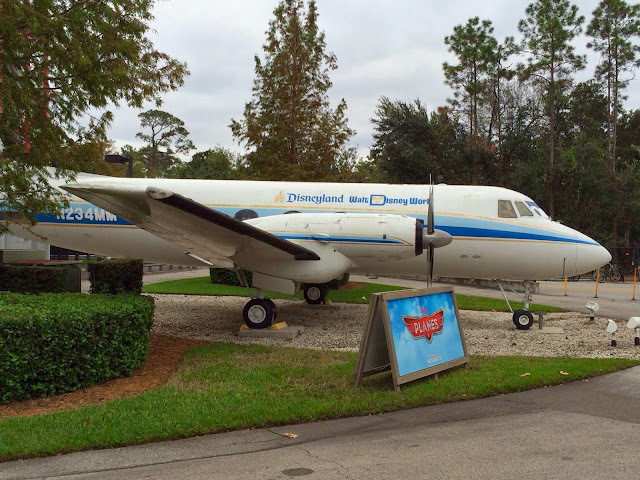 From a nostalgic standpoint, this often overlooked attraction is really a classic. 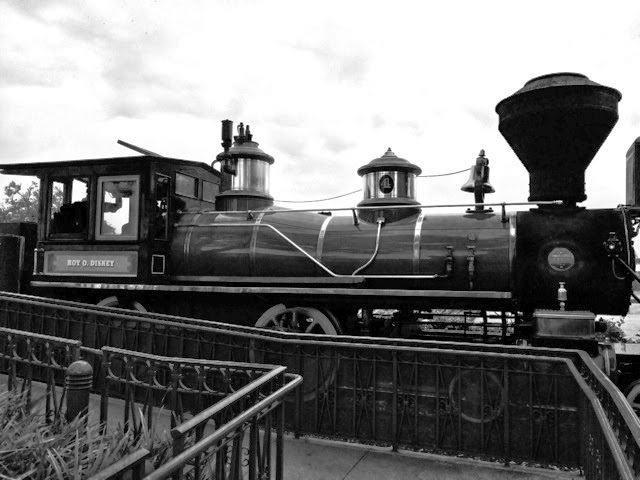 The Disneyland version was the very first attraction to feature "audio animatronics." Also, several of the birds' voices can be heard in other Disney attractions. Finally, the famous Sherman Brothers composed the theme song for the Tiki Room. They are best known for the music from Mary Poppins, as well as "it's a small world." This shot of a Tiki god coming to life is from my favorite part of the show. My family and I spent the afternoon at Wilderness Lodge today. This is one of my favorite resorts because of the detailed theming. One of these details is a geyser that sprays a stream of water up to 120 feet into the air about once an hour. 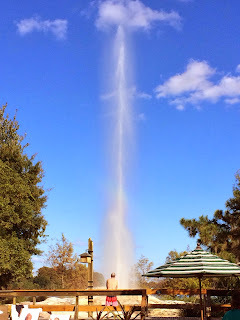 As we were walking next to the main pool, the geyser erupted right in front of us. I couldn't resist taking a couple of shots of this "display." Exactly four years ago today, the movie The Princess and the Frog was released. It became a hit for Disney and Tiana went on to be named an official Disney princess. 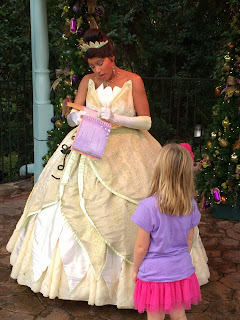 She has her own "meet and greet" area in Liberty Square at the Magic Kingdom. I snapped this shot as Tiana was signing an autograph for one of my young guests. Today is Walt Disney's 112th birthday. Of course this great man passed away back in 1966 at the age of 65. However, it is still important to honor this pioneer in family entertainment. It is because of Walt that I am able to make a living doing something that I truly love. As I was walking through Epcot today trying to think of a good photo to post tonight, I literally stumbled upon a cast member putting the finishing touches on this "chalk art" on the street in front of the U.K. I couldn't think of a more appropriate picture to post on this important date in Disney history! I spent a little time at Port Orleans Riverside today with my wife. This is a special place for us, as it was the first resort we stayed at as a couple.....on our honeymoon. There are so many great amenities at this location, including this great pool. Today was an unusually warm December day for Central Florida, with temperatures in the 80s. I'm sure there were many guests enjoying the pools around Walt Disney World today! After finishing a Magic Kingdom tour yesterday, I walked back to the Contemporary with my guests who were staying there. As I was walking to my car, I noticed an opportunity for a panoramic shot of the whole property. You can see Bay Lake Tower on the left and the main Contemporary tower on the right. This has always been one of my favorite resorts, for many reasons. In sticking with yesterday's theme of "very old attractions" I decided to post this picture of Prince Charming Regal Carrousel. Built by the Philadelphia Toboggan Company in 1917, this opening day attraction was originally known as Cinderella's Golden Carrousel. Disney changed the name to go along with the opening of New Fantasyland. 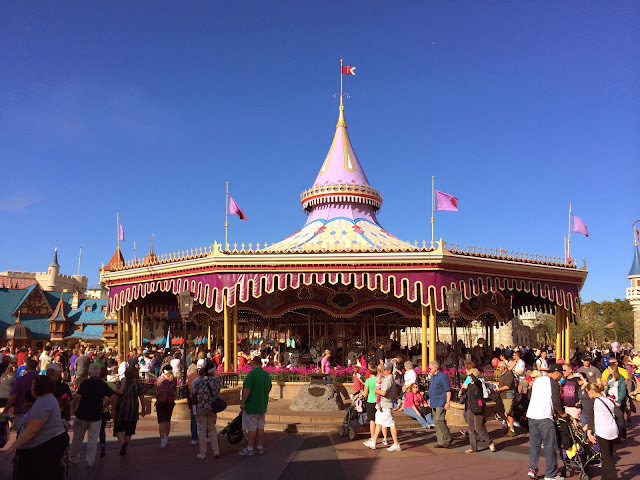 Since most of the original attractions in the new area were themed around princesses, they wanted to give the carrousel more of a boy theme. Whatever you want to call it, this classic ride has the distinction of being the oldest complete attraction in all of Walt Disney World. Although the Roy O. Disney steam train is older, the other three engines that make up the Walt Disney World Railroad are all younger than the carrousel. 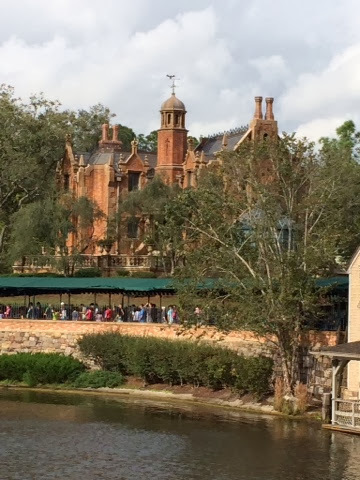 I took this shot while giving a Magic Kingdom tour today. Today marks the 42nd anniversary of the Roy O. Disney steam train making its debut at the Magic Kingdom. On December 1st, 1971, it became the fourth and final locomotive to be added to the line. The first three engines were in operation two months earlier, on October 1st. Built in 1916, the Roy also holds the distinction of being the oldest "attraction" at Walt Disney World. I took this shot today in black and white to simulate what it looked like when it was built almost 100 years ago. It seems like the Food and Wine Festival just ended, but Epcot has already started its next special event. Holidays Around the World includes live entertainment, a special finale for Illuminations, and unique food and drink offerings. We had the chance to enjoy this event tonight. 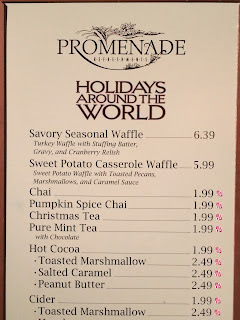 While waiting for Illuminations, we strolled over to Prominade Refreshments. 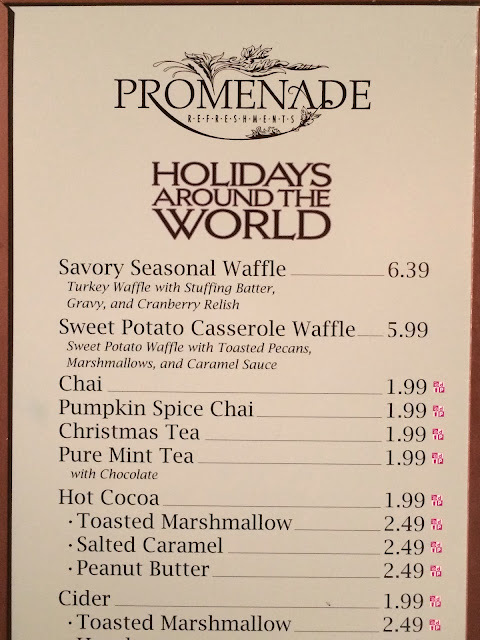 This photo shows some of the holiday treats. I got the peanut butter flavored hot cocoa and it was delicious! After several months of construction, the new Magic Kingdom bus stop loop finally opened. This will provide for increased capacity and new routes. I took this shot this morning, prior to giving a Magic Kingdom tour. The building in the background is Bay Lake Tower. After a great Thanksgiving dinner and a little football, we decided to take a ride to the Boardwalk Resort area to check out the Christmas decorations. We walked through the Boardwalk, Beach Club, Yacht Club, Swan and Dolphin. I will definitely be posting pics of the decorations in the near future, but this is the view that caught my eye tonight. The lights in the Dolphin fountain are synced with those on the palm trees, and they all change colors every few seconds. On this crisp, clear day, Universe of Energy looked great in the afternoon sun. It has been over 17 years since Ellen's Energy Adventure became the new show inside this pavilion. Ellen's co-star in the film is Bill Nye - The Science Guy. Today just happens to be his 58th birthday. I shot this panorama while my guests were enjoying the attraction. Today is the tenth anniversary of the release of The Haunted Mansion movie. Loosely based on the Magic Kingdom attraction, this Eddie Murphy film debuted on November 26th, 2003. Although it wasn't a big box office hit, there were some fun references from the ride. I thought it would be appropriate to post a Mansion photo. I took this shot today while giving a tour of the Magic Kingdom. This is a follow up from my post on November 22nd. On that day, I featured a picture showing the aerial view that Walt had when he discovered the property that became Walt Disney World. This is the actual plane he was flying in. It is located at Hollywood Studios, directly behind the Lights, Motors, Action stadium. It currently has "eyes" and a sign advertising the movie "Planes." I took this shot while on the Backlot Tour with my son yesterday. The Jedi Training Academy continues to a very popular experience at Hollywood Studios. You have to get to the sign up area early if you hope to get your child into one of the 15 shows that take place throughout each day. Today, my son had the chance to experience it for the first time. With the large Thanksgiving week crowds, they had both "bad guys" present. 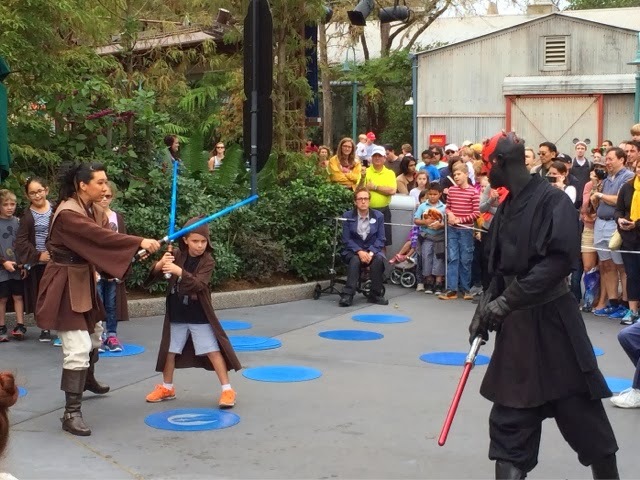 My son had the pleasure of going head to head with Darth Maul. 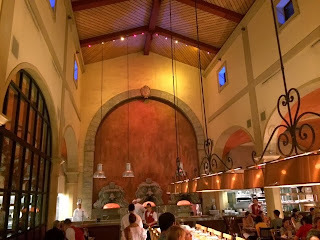 I had the chance to have dinner at Via Napoli last night. It is located toward the back of the Italy pavilion in Epcot. Via Napoli specializes in "wood-fired" pizza, and that is what I ordered. One of the things that I miss about CT is the great pizza. However, this location is the closest thing I've found since moving to Florida. It is difficult to make good pizza down here due to the quality of the water. To compensate for this, Via Napoli imports their water from a spring in Pennsylvania that has nearly the same chemical makeup as the water found in Napoli, Italy. It makes a big difference, as this pizza is delicious! Today marks the 50th anniversary of the assassination of John F. Kennedy. However, November 22nd, 1963 is also an important date in Walt Disney World history. In the months leading up to this day, Walt had been looking for the best spot to build his "second Disneyland." On this fateful morning, he was flying over Central Florida in his private plane, when Bay Lake caught his eye. He found the perfect location for Disney World. However, shortly after his plane landed, he was informed of the tragedy that had just taken place. Walt was a very patriotic man and the news was obviously upsetting to him. In the following months, the Disney company started buying up huge amounts of land in the area of Bay Lake, using fictitious company names. If the owners knew that it was Disney, the price of the land would have skyrocketed. I was able to take this photo a few years back, when I was a pilot and flight instructor. I was on final approach to Kissimmee Airport when I saw Bay Lake off to the right of the plane. You can see Discovery Island in the middle of that lake and Seven Seas Lagoon in the background. If you look closely, you can see the Contemporary Resort sitting between the two bodies of water. You can also see Space Mountain in this shot. I have to believe that Walt had a very similar view on that historic morning, 50 years ago. It seems like more and more Christmas decorations are popping up around Walt Disney World. One of the first to go up was the Animal Kingdom Christmas tree. I took this shot nearly two weeks ago. This giant tree sits just outside the gates to the park. It is properly themed, as it is decorated with many ornaments in the shape of animals. The latest version of the iPhone (the 5S) does a real nice job in low light situations. Apple made some significant improvements to allow more light into the shot. As we were walking on the path between Storybook Circus and Tomorrowland tonight, I snapped this photo of Space Mountain. I have many nighttime shots of this attraction in my library, but most of them are pretty grainy. This one came out better than expected. DDW Pic 812. Thank You! I want to say a huge thank you to everyone who continues to enjoy my daily pictures from Walt Disney World. Today, this website hit the milestone of 100,000 "page views." I started Digital Disney World almost three years ago as a way to stay connected to my favorite place. I could not have imagined that it was the start of something that would eventually lead my family to Central Florida to follow our dreams. I started the website on New Years Day in 2011 and originally wrote about how modern technology can keep us connected to Walt Disney World, even when we couldn't physically be there. As I wrote article after article during that first year, I realized that I wanted to turn my passion for this place I love into some sort of business. Eventually, I started WDW Guded Tours and have had the pleasure of helping so many guests enjoy the "Vacation Kingdom." Looking back, I now realize that my hobby of writing Digital Disney World helped to keep me focused on my goal of creating a Disney livelihood. Digital Disney World has evolved into a place where I can share a daily photo from somewhere around the resort. I usually try to post a current picture from that day, or at least from the very recent past. As busy as I've become with the tour guide business, I still look forward to spending 15 minutes each night choosing and posting a picture. I have heard from many people over the past couple years who enjoy seeing a daily dose of a place that they love. I am humbled and grateful that you take the time to view my "picture of the day." On this milestone day, I thought it appropriate to post a classic shot of the Magic Kingdom, as this is really where "The World" began. Hidden Mickey's have become very popular throughout the Walt Disney World Resort over the past decade. Typically formed with three circles (one for the head and two smaller ones for ears), these "Mickey's" are hidden all around the parks and even in the resort hotels. I love to point them out to my guests while I'm giving tours. 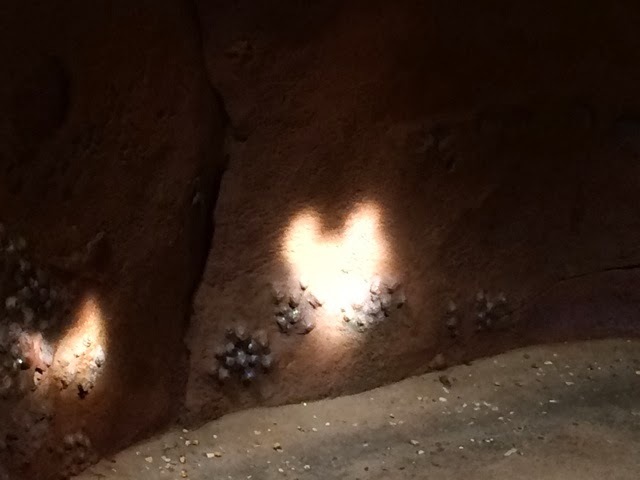 I have my favorites in each park, but today I saw what is by far the best hidden Mickey ever created. It is amazingly unique in that it can only be seen on November 18th at exactly noon. 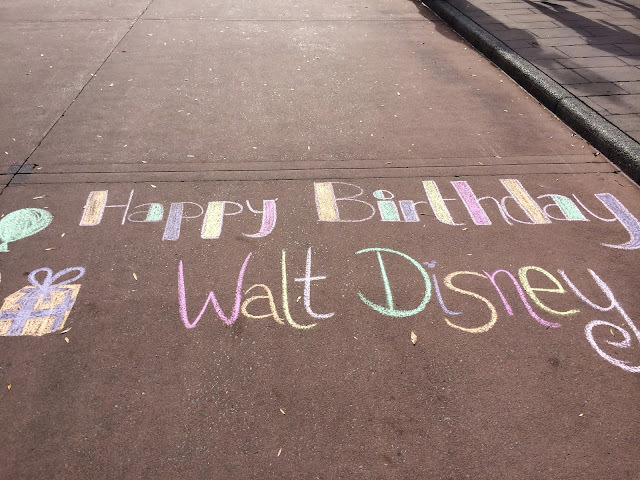 Most Disney enthusiasts know this date to be Mickey's birthday. The Imagineers decided to pay tribute to the famous mouse over at the relatively new Under the Sea attraction in the Magic Kingdom. They carved part of the rock formation in the queue to allow the sun to shine through onto the base of a wall. The sun's rays are at the perfect angle on this day at noon to form Mickey's head. The formation only lasted for about 7 minutes, but it was quite a sight to see! 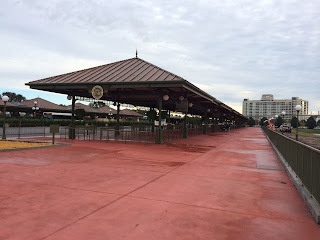 The Walt Disney World Railroad has become a must-do whenever we visit the Magic Kingdom. Our son is a huge train buff and he absolutely loves the old steam engines that circle this park. I took this shot of the Roger Broggie at Fantasyland Station tonight. It's tender had just finished being filled with water from the tower at this station. They need to be topped off with water every three to four trips around the park. You can see the big metal tube had just been raised and the cast member was about to close the cover with a long tool. 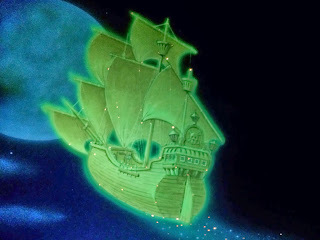 One of my favorite attractions at Walt Disney World is Peter Pan's Flight. It is a classic for many reasons, but mainly due to the fact that it has remained virtually unchanged for over 40 years. It is simplistic in its design and really doesn't use any modem technology. 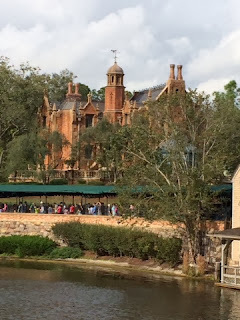 However, it routinely has some of the longest lines in the park and it is still as popular today as it was in 1971. It was closed for over a month for a routine refurbishment, so I couldn't resist riding when it reopened a few days ago. This is a shot of the last scene, which is depicted in glowing paint just prior to exiting the ride. Big Thunder Mountain Railroad is one of the best themed roller coasters anywhere. 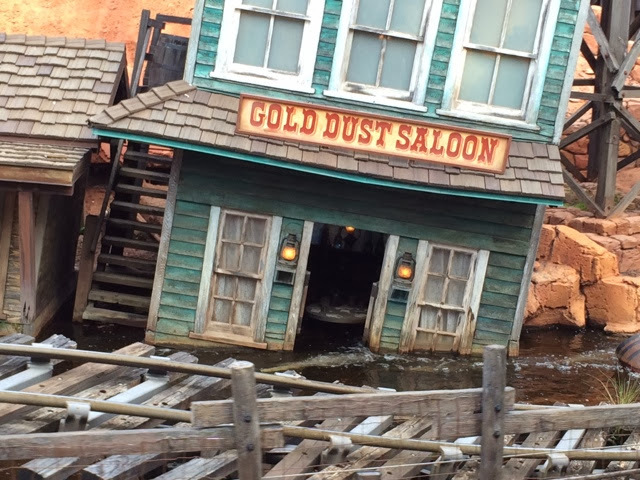 Although most guests don't know the "story" behind the runaway mine train, they still enjoy the scenery found in the ghost town of Tumbleweed. Even though the coaster is racing around the mountain at speeds up to 30 mph, the details that can be seen are quite amazing. 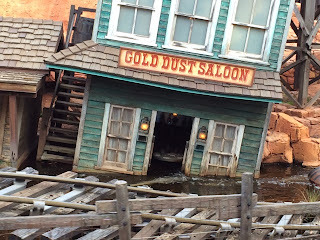 This shot of the flooded "Gold Dust Saloon" wouldn't be possible while riding Thunder Mountain, but I was able to take it from the nearby Walt Disney World Railroad, as I rode by yesterday. If you look closely, you can even see the abandoned card game that was being played before the flood came! Often times, the key to taking a good photo is timing. Sometimes you can set up the timing of a shot with advance planning and other times you just get lucky. When I was arriving at the Magic Kingdom today, I got lucky. 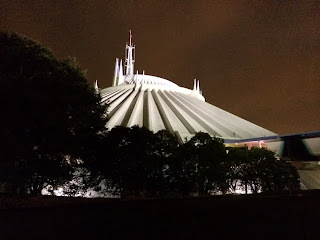 I was on the monorail with my son and we had just passed Space Mountain on our way to the Magic Kingdom station. 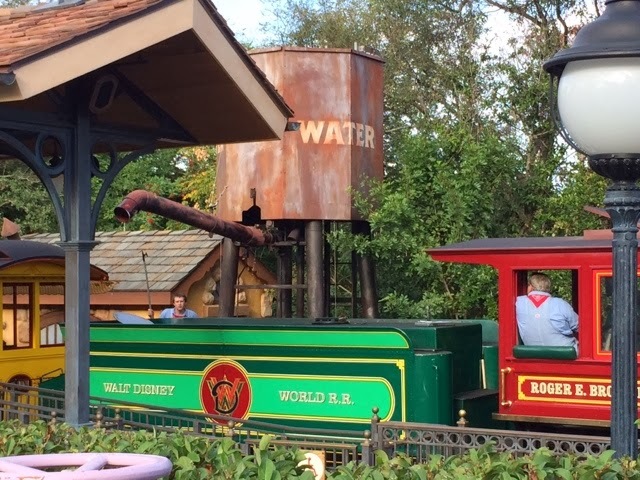 I noticed the Walter E. Disney steam train moving at about the same speed of the monorail. 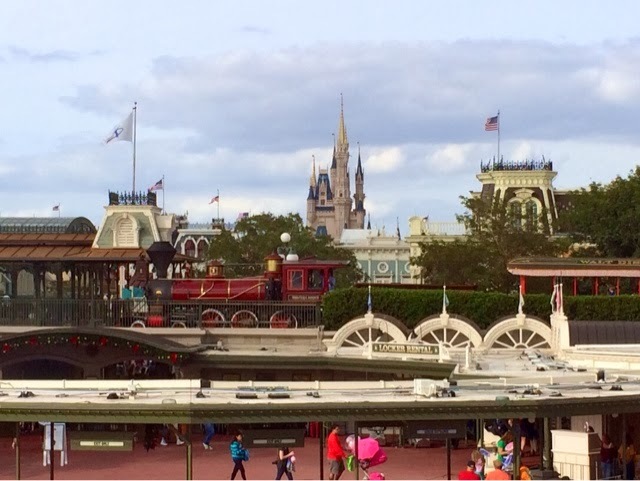 I saw a good photo opportunity developing and I snapped the shot just as the engine was lined up with Cinderella Castle in the background. I love it when an unplanned situation turns into the "Picture of the Day." It was recently announced that Celebrate a Dream Come True was going to be retired in early 2014. This version of the Magic Kingdom parade has been around for more than a decade. I want to catch it as much as possible before it's final performance in January. Today, I was able to get a spot on the second level of the train station. This is one of the best locations to get a clear shot of the characters on the floats. Tonight was the first night of the season that I was able to see the Osborne Family Spectacle of Dancing Lights at Hollywood Studios. I took my family, who experienced it for the first time ever. 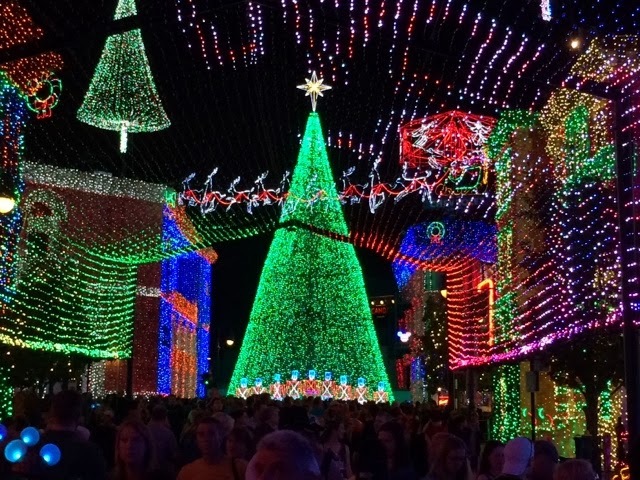 With millions of individual lights, this is truly one of the largest holiday displays in the world. I took this shot of the seventy foot tall Christmas tree from the San Francisco street. This tree alone is made up of over 100,000 lights. I am looking forward to visiting this area of Hollywood Studios many times before the Christmas season is over!